Television heroes may be cancelled but they’re certainly not forgotten. Over 15 years after his show went off the air, action hero MacGyver is America’s top choice to save them in a disaster. MacGyver ran for seven seasons on ABC from 1985 until 1992. 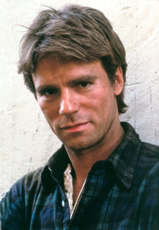 Richard Dean Anderson played the title character who was famous for not using a gun and instead utilizing everyday items to get out of impossible situations. MacGyver hasn’t been seen much since the series ended (other than two 1994 reunion movies and a 2006 MasterCard commercial), a fact that the results of a recent survey all the more impressive. If a hurricane, flood or other disaster struck your community and government services were overburdened, what if a movie or TV hero could come to the rescue? A new McCormick Tribune Foundation disaster preparedness poll finds more than one in four Americans facing a disaster would most like the fictional help of the resourceful Angus MacGyver. MacGyver received 27% of the overall vote while closest runner-up Indiana Jones got only 16%. Die Hard’s John McClane got 14%, James Bond and Jason Bourne each received 8% and, 7% each went to 24’s Jack Bauer and Tomb Raider heroine Lara Croft. The survey takes a lighthearted approach in order to draw attention to a serious subject — the need for Americans to become better prepared for disasters. The McCormick Tribune Foundation encourages citizens to create their own disaster response plans and assemble emergency kits with essentials like a three-day supply of water and nonperishable food, a flashlight and radio, extra batteries, a blanket, a first-aid kit and cash. McCormick CEO and Brigadier General (Ret.) David L. Grange said, “While we would want help from MacGyver or any fictional hero during an emergency situation, the reality is we need to be prepared. By being prepared, individuals and communities can handle the initial 72 hours after a disaster and may serve as temporary alternatives to government resources.” Stay tuned! MACGYVER IS THE BEST SHOW EVER I LOVE RICHARD DEAN ANDERSON HE STILL HAS MY HART! Um, the article’s talking about the character of macgyver, not R.D. Anderson. “MacGyver” hasn’t been around much?! Richard Dean Anderson has been on StarGate SG-1 (now cancelled) since 1997! He was the best part of the show until he left a season (or 2?) ago.